2016 is historic for a staggering increase in website hacking, yet site owners need to beware of email scams. 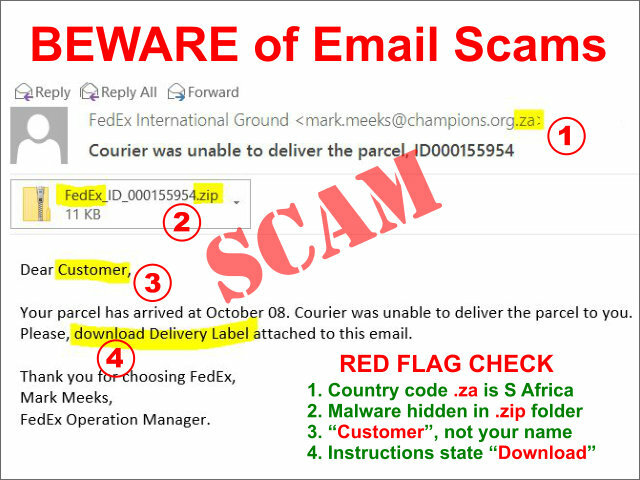 Your online business or personal security may be at risk if you unwittingly open email and download malware. Any one of those 4 clues should raise suspicion, so don’t act out of curiosity without a closer inspection. What could go wrong? Here’s an actual client experience. Their customer called to say expect project photos. As they hung up an email arrived. All they noticed was a zip folder, then downloaded, unzipped, and opened it. They clicked the document. It was a hacker’s payload of ransomware that instantly locked up their computer. The customer was not a hacker. The timing was mere coincidence. It took over a week and long hours to recover. Final Tip: Be suspicious of any zip folder, yet be aware that online or email links can lead to disaster, too.